I have something I blame on my mother. :) Well, and my father. You see, when I was four years old, my parents moved us from Morgantown, W.Va. in the northern part of the state to Huntington, W.Va. in the southern part of the state. No big deal, right? You would think not. However, in order to understand where this is going, you have to understand something about the state of West Virginia. Not sure if you've picked up on this, but West Virginia does not have a good reputation in the United States concerning, well, just about anything whatsoever. We have more teenage pregnancies, more smokers, more obese people, etc. then pretty much anywhere else in the union. Except maybe Mississippi. In fact, West Virginia's unofficial motto is "Thank God for Mississippi" because if we rank 49th in something, chances are they're 50th. If we get any good press in the nation, it's usually because of one thing: our sports teams are doing well. Namely, the West Virginia University Mountaineers are doing well. And that's where our story really takes off. West Virginia University is located in Morgantown, W.Va. Its colors are gold and blue and its football and basketball teams have a generally impressive reputation nationally. (However, please don't check the stats this year. If you can't help yourself, then please Google "Tavon Austin" or "Geno Smith.") The thing is -- the state of West Virginia has another school, Marshall University. 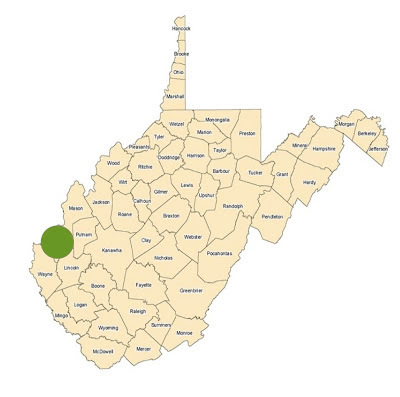 It is located in Huntington, W.Va. Their colors are green and white and their teams are, frankly, crappy. Marshall used to have a good football team, but that was years ago and they have not been able to regain the glory days of the '90s. So, let's review: West Virginia University -- named after the state, colors are the state colors; Marshall University -- mostly completely unrelated to the state of West Virginia in general except it's located within the state lines. My mother grew up in Morgantown, my dad grew up in north central West Virginia, dad went to WVU, my grandparents are in Morgantown, my mom's sister is in Morgantown, my great aunts and uncles are all in Morgantown, etc. etc. Needless to say, I live in a family of die-hard WVU fans. And this really shouldn't be shocking, as most of the entire state of West Virginia are WVU fans. There is one exception -- those residing in the county of Cabell are Marshall fans. And by Marshall fans, I mean WVU HATERS. HATE. ERS. Below is a rendering of college football fandom in the state of West Virginia. The green represents where Marshall fans (and I) reside. The yellow represents where WVU fans live. So my four-year-old bred-to-love-WVU self was callously uprooted from my home in Morgantown to move to Huntington, home of Marshall fans. My parents had FIFTY FOUR COUNTIES of WVU fans in which to choose to live, but those hatas chose the ONE COUNTY where we would suffer endless persecution. The excuse they provide is "dad found a job here!" What kind of reason is that?! If WVU is a religion, then the Huntington Lafferres are its chief martyrs. I mean seriously -- when you cross the Cabell county line and enter into Putnam, BAM -- WVU fans. No one gives a little hootie patootie about Marshall outside of this county. I'm sure they do this outside of West Virginia, but in our city certain days of school were designated "wear your Marshall shirt to school day." Well that's cool, what if YOU DON'T HAVE ONE? Trying to get someone to watch the WVU game with you on Saturday? Say hello to hanging out with your parents only. Going on a date and hoping to find a mutual love of college football? BY ALL MEANS DON'T SAY THE LETTERS WVU. The thing is -- in my family, we are actually Marshall fans too. We want them to do well, watch their games and cheer them on. Do we get any reciprocal love from Marshall fans for our dear school? Pfffffffffffffffffff. Negative. All I'm saying is, it's not my fault that seeing those gold and blue jerseys jog onto the field with the sun beating down and the smell of the leaves in the air just does something to my heart. IT WAS THE WAY I WAS BORN. I have seen my grandmother get more upset about more WVU sports-related incidents than you would ever believe for a grandma. Let's just say. If I never get married because no one in this area can get past my love of the gold and blue, it will not be my fault. I'm looking at YOU Luke and Kathy Lafferre. I'm looking at you.